StorQuest Self Storage in Thousand Oaks, CA, is a full-service self storage facility located in downtown Thousand Oaks on Skyline Drive, just north of Thousand Oaks Boulevard. We offer personalized self storage solutions designed to help you stay organized. Small, medium, and large storage lockers are available at StorQuest. This brand-new, state-of-the-art facility features access seven days a week, month-to-month rentals, and online bill pay, as well as many more convenient amenities. 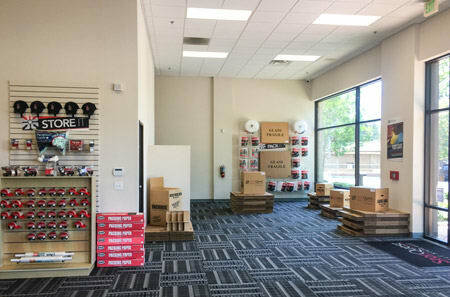 For added convenience, the Thousand Oaks facility also offers packing and moving supplies. Our friendly and professional staff will be happy to assist you with choosing the appropriate supplies for your next packing project. We offer self storage solutions for both individual and commercial customers. Business owners can benefit from our commercial storage solutions in a variety of ways. Self storage is a simple, convenient, and affordable alternative to expanding your commercial space to accommodate the tools of your trade. Not only do we provide email invoicing and accept deliveries on your behalf, StorQuest also offers climate-controlled storage, which is ideal for housing temperature-sensitive items like paperwork, files, and records. For more information on the features offered at StorQuest Self Storage in Thousand Oaks, contact our leasing office today. Let us help you clean up your home or office!